Clissold Park had been one of the great beauties of Stoke Newington for as long as anyone could remember. Nobody alive could remember before the house was built for the Hoare banking family. It had been sited to overlook a wide sweep of the New River which crossed Green Lanes, curved through the Park, ran along parallel to Stoke Newington Church Street, under Paradise Bridge (which was opposite the modern Gayton House flats) and off down the centre of Petherton Road, open to the sky all the way. The Park seemed to have been there for ever, with its trees growing more splendid year by year. After the Hoares, the house and park had come into the hands of Mr Thomas Gudgeon, who lived there in 1804. The next occupant was Mr Crawshay, one of the Northumbrian branch of the ‘Iron Kings of Cyfarthfa’. The family owned iron mines, slate quarries and other industrial property on an immense scale and were reported to be the richest commoners in England. Mr Crawshay obtained the perpetual lease of the property from the Ecclesiastical Commissioners at a yearly rental of ‘£109 and a fat turkey.’ No doubt that same turkey had been copied from lease to lease for hundreds of years, as the property changed hands. The lease prohibited the cutting down of trees or the granting of building leases. (These provisos were to become very important years later). 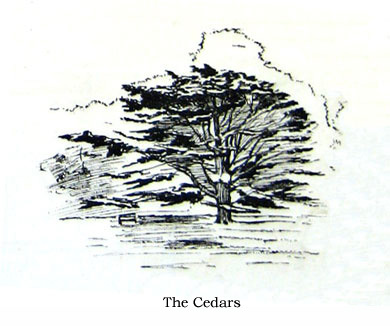 The various owners of the park had continued to landscape the property over many years. Loddiges had their famous nurseries nearby in Hackney, around Well Street. Newly discovered shrubs and trees were brought in every few months by Royal Navy ships from all over the World, so that the variety of plants available was enormous. The whole area was garden conscious. Some famous botanists lived in Stoke Newington and rare plants found here and along the river are listed in Victorian volumes. 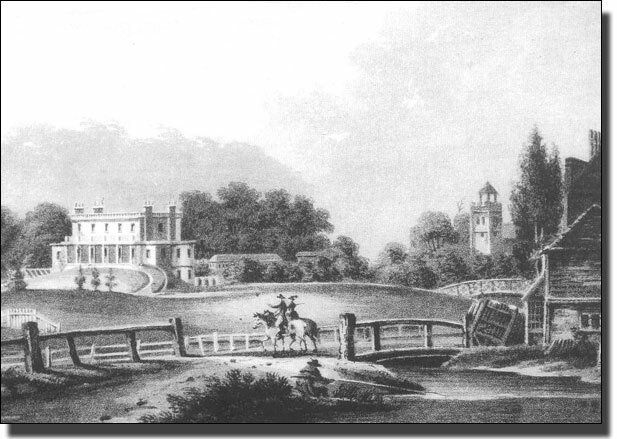 The grounds of Clissold House had been laid out as a spacious landscaped park, with long avenues of native and foreign trees. Stoke Newington gardens were full of rare specimens and this was the biggest garden of them all. Moreover, the Park was very public: not hidden away like other gardens. Anyone walking along Green Lanes or Church Street could enjoy the trees. When The Rev. 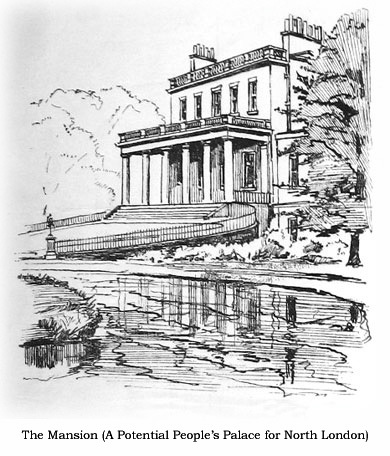 Clissold died the property reverted to the Crawshay family, and Mr George Crawshay became the owner. He kindly threw open part of the Park on certain days for the enjoyment of the general public. At the same time he pointed out that this would last only as long as he lived as he had no power to extend the right after his death. Mr Beck, a public spirited man who lived nearby in Albion Road, paid out of his own pocket to provide proper police supervision for this public use of the park, but when the Home Secretary heard about it, he ruled that the police had been employed in public service and the money was returned to Mr Beck. Four things had been established. 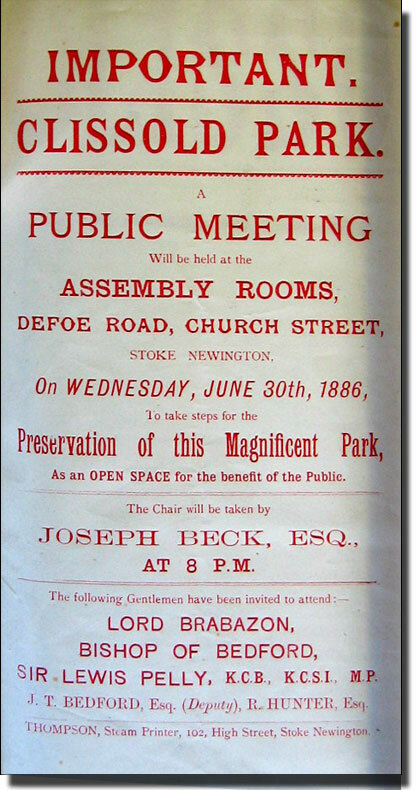 The public had learnt to stroll in the park and value it, but had been told that this was not a legal right: Mr Beck had shown his intense interest in the park, and the government had recognised in some small way, the value of the park to the people of Stoke Newington by paying for the police. Then came a bombshell. On 22 June 1886, Mr Beck wrote from Barton House, his home in Albion Road. His letter was a warning and an urgent call to action. Despite Mr Crawshay’s earlier statements, he had parted with all his interest in the estate. 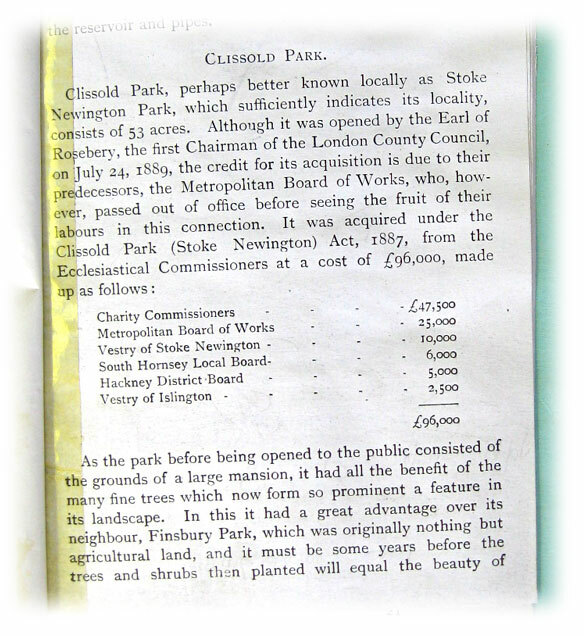 Clissold Park was to be sold, the trees felled and the land laid out as building plots. ‘Now Clissold Park, the very last and most beautiful’ [open space was under threat]. ‘I appeal and beg of the inhabitants to bestir themselves and use every effort to preserve Clissold Park as an open space for the recreation of the public’. Crawshay had sold houses and park to the Ecclesiastical Commissioners for £65,000. They planned to build on the land, but as there was by now little open space in Stoke Newington following the main population increase in the 1870's. there was a public outcry. This lovely open space was to become a maze of anonymous streets, bleak, characterless and repulsive to everyone who loved the Park. Trees which people had known all their lives would be felled. The New River, which came along Riversdale Road, under a bridge in Green Lanes, swept into the Park, up to the house which had been sited to take full advantage of the curving view, and back again along Church Street, left the Park under Paradise Bridge and down to Petherton Road, had been there from King Charles’ time. Nobody alive had known the area without the river and its rural setting. The river bank, where generations had fished and promenaded and courted, would be asphalted over. All heaven would be lost. That was the reaction of the general public, while the feelings of those who lived in the valuable Church Street houses the faced the Park, must have been apoplectic. This stretch is called Paradise Row for good reason. They were the most desirable house in Stoke Newington and the whole of London. Their census returns reflect this. Over the years they read like a roll call of successful empire builders. The 1851 census shows the sort of people who could afford houses in such a position. It lists rich annuitants and professional people and the 1881 list was similar. The prominent people mentioned in Mr Beck’s letter, were prominent indeed: people who knew how the world wagged: who knew the right people to talk to: people you would prefer to have on your side. About 40 prominent local people like this had met in Mr Beck’s house and planned a pubic meeting at the Assembly Rooms, Defoe Road, on June 30 th, which was less than a week later. A committee was set up by Joseph Beck and John Runtz in order to try to purchase the estate and mansion for the public of Stoke Newington. Petitions would be sent to the Ecclesiastical Commissioners, The Corporation of London and the Metropolitan Board of Works, signed by all the inhabitants. 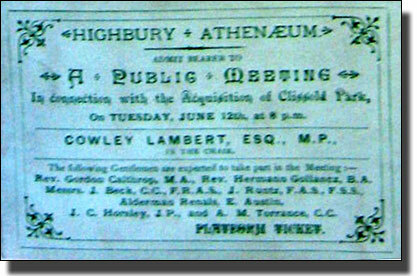 There were public protest meetings in Defoe Road and at The Highbury Athenaeum. A petition signed by 12,000 people was presented to the Metropolitan Board of Works (The forerunners of the London County Council). Local Members of Parliament and the Clissold Park Preservation Society were prominent in the campaign. The Church Commissioners had collected some vociferous opponents and it was not the first time. Highgate Wood had already raised a storm. 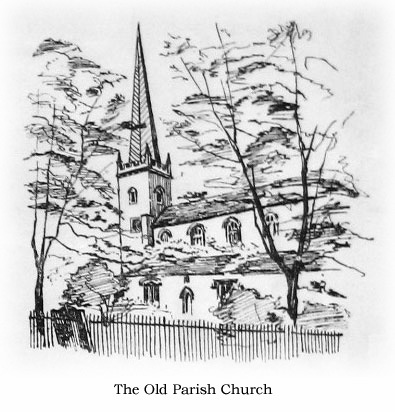 Over the years the Church Commissioners had tried to build houses on what the public regarded as common land and had been defeated in the end. The campaign to save Clissold Park was part of a huge movement which had been gathering force since 1855 and before. People were getting used to regarding the Ecclesiastical Commissioners as bloodsuckers. London is so to say always in a more or less advanced state of advanced tubercular disease. Unluckily it cannot, unlike any other consumptive patient, be transported bodily to some Southern clime or bracing alpine altitude, there to regain health and vigour. But at least something can be done to save the sound half lung or so which is all that remains to it from being choked and silted with cheap bricks and mortar until respiration in the failed City has become impossible. It is not so many months ago that London heard that Parliament Hill and Highgate Woods were doomed, and London rose in wrath and swore it was not to be. The jerry-building fiend, thus disappointed of his prey, now turns his monster jaws and smacks his monster lips in the direction of another Park. covers. Here in the early years of the [nineteenth] century and around Newington Green flourished a brilliant literary coterie of slightly Utilitarian flavour, while Church Street through all changes, still retains a certain lingering air of quietude and quaintness. Here too in the Green Lanes, of which alas the name alone survives, used James Mill to take his daily airing, hand in hand perhaps with his portentous little son John – if indeed two such grimly philosophic minds can be supposed ever to have condescended to so trivial an action. Stoke Newington, which is now the centre of one of the most densely populated districts of Greater London was, even forty years ago, a pleasant village within easy reach of the city, separated from it by a mile or two of hedgerow and green field, the steeple of its quaintly rural parish church (fabled to be hung with silver bells, the gift from a royal patroness) just peeping out over the tree tops. Of this fair picture all that now remains are the church, a row of primly tiled and pedimented Queen Anne houses and Clissold Park which stretches away behind in all the glory of over fifty acres of magnificent timbered grassy fields and washed by the sluggish waters of the New River which, like some agreeable terrestrial Styx, coils itself sleepily in and through and round the park. This little earthly paradise it is – verily and indeed giving the name of “ Paradise row” to a row of houses overlooking it – which is now threatened with destruction. Commissioners by who it has already been marked out in plots for building. It happens that the dividing line of the parishes of South Hornsey and stoke Newington roughly bisecting the park causes one half to fall within the scope of the Metropolitan Board of Works and the other half within that of the Corporation. Application is about to be made to both of these bodies which, sharing the pecuniary burden may fairly be expected to vie with each other in consideration for the public good. The Ecclesiastical Commissioners can be reasonable and even generous, as they have lately shown at Kilburn, Highgate and elsewhere and it is believed that a sum considerably short of the £95,000 at which their demand presently stands would satisfy their claim. bathed in golden sunlight, its giant chestnuts dipping their heavy branches lazily in the water. Finsbury Park, let it be remembered, started its career as so much waste land, and it will be years yet before the trees and shrubs planted then make any considerable show. Here in Clissold Park we have a finely timbered tract of land ready to our hand. with the additional charm of a pleasant stretch of the New River which, if the park be sacrificed, will be carried underground in a pipe. Surely there cannot be two opinions as to the paramount necessity of securing one more breathing space for suffocated London. The case is urgent; in in a few months, if no saving hand is held out, Clissold Park will be a wilderness. There was a ferocious campaign to save the Park, so powerful that it would probably have won anyway, as happened in other places, but one old clause finally closed the argument. This stipulated that the park had to be sold in one complete lot. It could not be sold in pieces. No builder or developer had that sort of money and therefore the Church Commissioners had no hope of finding a buyer. 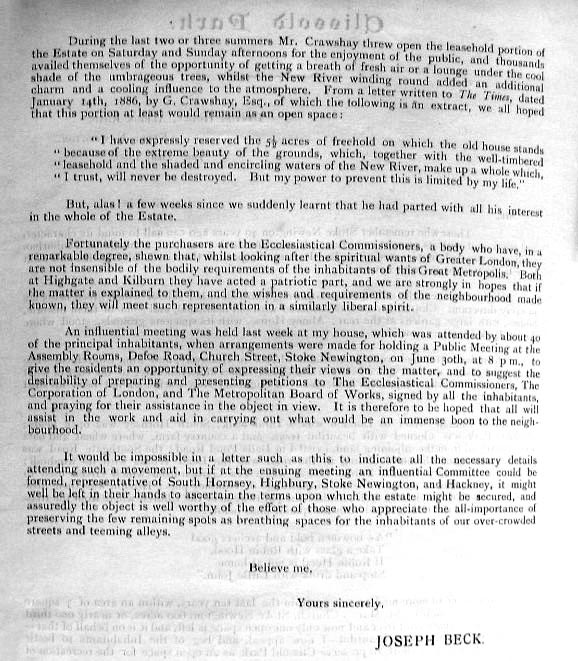 Beck and Runtz continued to pressurise the authorities and the Ecclesiastical Commissioners and the estate was eventually acquired under the Clissold Park (Stoke Newington) Act 1887 from the Ecclesiastical Commissioners at a cost of £96,000. Clissold Park, consisting of 54 acres, was opened on 24 July 1889 by the Earl of Roseberry, the first chairman of the London County Council, but their predcessors had done the hard work. The Park consists of 53 acres and was opened in 1889. It was well wooded then and today it holds more than fifty varieties of trees, some of them magnificent specimens. The grounds had been laid out according to the ideas of Repton who believed in irregular paths which turned to reveal new vistas of apparently unlimited extent. Groups of trees were arranged to give surprising changes. Shrubberies like the one behind the old St Mary’s Church opened suddenly into parkland or an ordered avenue of lofty trees. Surprise and apparent space were the aims and we still experience these in Clissold Park today. Clissold Park was one of the first London municipal parks in which bird and animal life was specifically provided for. An animal enclosure was established before 1900 and the introduction of deer was regarded as a ‘bold experiment due to the confined space.’ There were donkeys, a wallaby and an aviary. dington Recreation Ground}, and a dozen other places around London, had all been defended by local action and many had been saved. 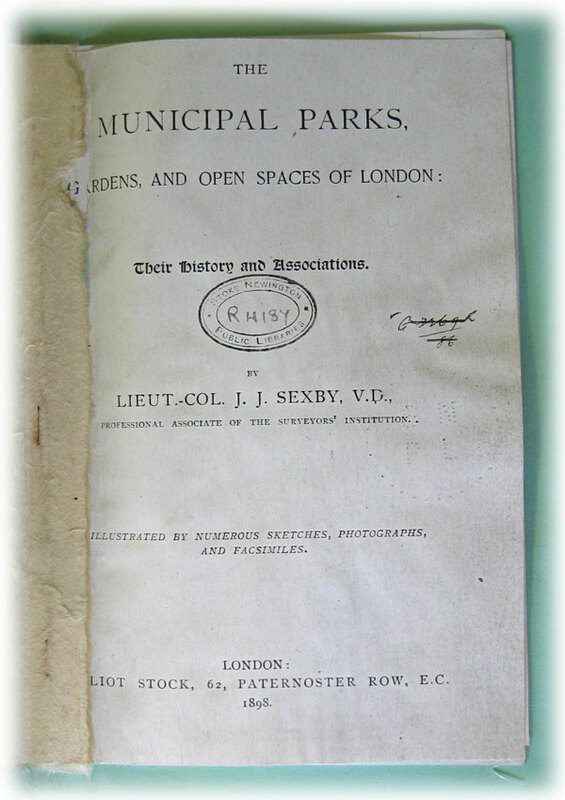 Cliss pk sexby.doc Facsimile Pages of THE MUNICIPAL PARKS: Gardens and Open Spaces of London by Lieut. Col. J.J. Sexby. In the 1880s the Church Commissioners planned to develop Gravel Pit Wood (now called Highgate Wood) by building rows of houses as they had done in other parts of the Borough. It was their property and they had the legal right to do so, but the public outcry was so great that the Commissioners decided instead to build a road instead through Bishop's Wood (now Bishop's Avenue) and to give Highgate Wood to the public. They asked the City of London to accept and maintain the Wood as an open space. Barton House has now been demolished and the Barton House Health Centre built on the site.